That geographically contiguous units are demarcated regions which should be constituted, with such territorial readjustments as may be necessary that the areas in which the Muslims are numerically in a majority as in the North Western and Eastern Zones of (British) India should be grouped to constitute ‘independent states’ in which the constituent units should be autonomous and sovereign. Although the name "Pakistan" had been proposed by Choudhary Rahmat Ali in his Pakistan Declaration, it was not until after the resolution that it began to be widely used. Muhammad Ali Jinnah's address to the Lahore conference was, according to Stanley Wolpert, the moment when Jinnah, a former proponent of Hindu-Muslim unity, irrevocably transformed himself into the leader of the fight for an independent Pakistan. Democratic systems based on the concept of homogeneous nation such as England are very definitely not applicable to heterogeneous countries such as India, and this simple fact is the root cause of all of India’s constitutional ills……If, therefore, it is accepted that there is in India a major and a minor nation, it follows that a parliamentary system based on the majority principle must inevitably mean the rule of major nation. Experience has proved that, whatever the economic and political program of any political Party, the Hindu, as a general rule, will vote for his caste-fellow, the Muslim for his coreligionist. An India-wide attack on the Muslims was launched. In the five Muslim provinces every attempt was made to defeat the Muslim-led-coalition Ministries,...In the six Hindu provinces a “Kulturkampf” was inaugurated. Attempts were made to have Bande Mataram, the Congress Party song, recognized as the national anthem, the Party flag, and the real national language, Urdu, supplanted by Hindi. Everywhere oppression commenced and complaints poured in such force…that the Muslims, despairing of the Viceroy and Governors ever taking action to protect them, have already been forced to ask for a Royal Commission to investigate their grievances. Is it the desire (of British people) that India should become a totalitarian Hindu State….? ….. and I feel certain that Muslim India will never submit to such a position and will be forced to resist it with every means in their power. While Muslim League irrevocably opposed to any Federal objective which must necessarily result in a majority community rule under the guise of Democracy and Parliamentary system of Government...To conclude, a constitution must be evolved that recognizes that there are in India two nations who both must share the governance of their common motherland. The resolution text, unanimously approved by the Subject Committee, accepted the concept of a united homeland for Muslims and recommended the creation of an independent Muslim state. 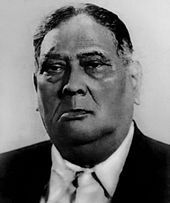 A. K. Fazlul Huq presented the historical Lahore resolution in 1940. The resolution was moved in the general session by A. K. Fazlul Huq, the chief minister of undivided Bengal, and was seconded by Chaudhry Khaliquzzaman from the United Provinces, Zafar Ali Khan from Punjab, Sardar Aurangzeb Khan from North-West Frontier Province, and Sir Abdullah Haroon from Sindh. Qazi Muhammad Essa from Baluchistan and other leaders announced their support. 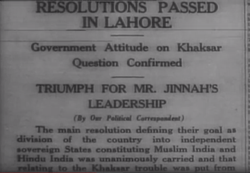 25 March 1940: Newspapers printed news about Lahore Resolution, demanding division of India. That adequate, effective and mandatory safeguards shall be specifically provided in the constitution for minorities in the units and in the regions for the protection of their religious, cultural, economic, political, administrative and other rights of the minorities. Resolved at the Lahore Session of All-India Muslim League held on 22nd-24th March, 1940. (1) While approving and endorsing the action taken by the Council and the Working Committee of the All Indian Muslim League as indicated in their resolutions dated the 27th of August, 17th and 18th of September and 22nd of October, 1939, and 3rd February 1940 on the constitutional issues, this Session of the All-Indian Muslim League emphatically reiterates that the scheme of federation embodied in the Government of India Act, 1935, is totally unsuited to, and unworkable in the peculiar conditions of this country and is altogether unacceptable to Muslim India. (2) It further records its emphatic view that while the declaration dated the 18th of October, 1939 made by the Viceroy on behalf of His Majesty’s Government is reassuring in so far as it declares that the policy and plan on which the Government of India Act 1935, is based will be reconsidered in consultation with the various parties, interests and communities in India, Muslim India will not be satisfied unless the whole constitutional plan is reconsidered de novo and that no revised plan would be acceptable to the Muslims unless it is framed with their approval and consent. (3) Resolved that it is the considered view of this Session of the All India Muslim League that no constitutional plan would be workable in this country or acceptable to Muslims unless it is designed on the following basic principle, namely that geographically contiguous units are demarcated into regions which should be so constituted, with such territorial readjustments as may be necessary, that the areas in which the Muslims are numerically in a majority as in the North-Western and Eastern Zones of India, should be grouped o constitute “Independent States” in which the constituent units shall be autonomous and sovereign. That adequate, effective and mandatory safeguards should be specifically provided in the constitution for minorities in these units and in these regions for the protection of their religious, cultural, economic, political, administrative and other rights and interests in consultation with them; and in other parts of India where the Mussalmans are in a minority, adequate, effective and mandatory safeguards shall be specially provided in the constitution for them and other minorities for the protection of their religious, cultural, economic, political, administrative and other rights and interests in consultation with them. This Session further authorizes the Working Committee to frame a scheme of constitution in accordance with these basic principles, providing for the assumption finally by the respective regions of all powers such as defense, external affairs, communications, customs and such other matters as may be necessary." There remains a debate on whether the resolution envisaged two sovereign states in the eastern and western parts of British India. Abdul Hashim of the Bengal Muslim League interpreted the text as a demand for two separate countries. In 1946, Prime Minister H. S. Suhrawardy of Bengal, a member of the All India Muslim League, mooted the United Bengal proposal with the support of Muslim and Hindu leaders, as well as the Governor of Bengal. However, it was opposed by Lord Mountbatten, the Muslim League, the Congress and the Hindu Mahasabha. Although there were and continue to be disagreements on the interpretation of the resolution, it was widely accepted that it called for a separate Muslim state. Opposing opinions focus on the phrase "independent states" claiming this means Muslim majority provinces, i.e. Punjab, Sindh, etc. would be independent of each other. They ignore the phrase "geographically contiguous units." They also rely on the claims of certain Bengali nationalists who did not agree with one state. They accuse their opponents of diverting the "spirit" of the resolution. The majority of the Muslim League leadership contended that it was intended for not only the separation of India but into only 2 states (Muslim majority and Hindu majority). Therefore, it is indeed a statement calling for independence and one Muslim state. Eventually, the name "Pakistan" was used for the envisioned state. The Sindh assembly was the first British Indian legislature to pass the resolution in favour of Pakistan. G. M. Syed, an influential Sindhi activist, revolutionary and Sufi and later one of the important leaders in the forefront of the Sindh independence movement, joined the Muslim League in 1938 and presented the Pakistan resolution in the Sindh Assembly. A key motivating factor was the promise of "autonomy and sovereignty for constituent units". This text was buried under the Minar-e-Pakistan during its building in the Ayub regime. In this session the political situation was analysed in detail and Muslim demanded a separate homeland only to maintain their identification and to safeguard their rights. Pakistan resolution was the landmark in the history of Muslim of South-Asia. It determined for the Muslims a true goal and their homeland in north-east and north-west. The acceptance of the Pakistan resolution accelerated the pace of freedom movement. It gave new energy and courage to the Muslims who gathered around Muhammad Ali Jinnah for struggle for freedom. To commemorate the event, Minar-e-Pakistan, a monument 60 m tall in the shape of a minaret, was built at the site in Iqbal Park where the resolution was passed. 23 March (Pakistan Day) is a national holiday in Pakistan to commemorate both Lahore Resolution (1940) and the Republic Day (1956); the country became the first Islamic Republic in the world. ^ Korejo, M S (1993). The Frontier Gandhi: His Place in History. Oxford University Press. p. 152. ISBN 0195774612. ^ Dockter, Warren (2015). Churchill and the Islamic World: Orientalism, Empire and Diplomacy in the Middle East. I. B. Tauris (1818). p. 240. ISBN 1780768184. ^ "The Case of Sindh - G.M. Syed's deposition in court (Part 4)". GMSyed.org. Naeen Sindh Academy. Retrieved 20 July 2018. ^ Stanley Wolpert (1984). Jinnah of Pakistan. Oxford University Press. p. 182. ISBN 978-0-19-503412-7. Jinnah's Lahore address lowered the final curtain on any prospects for a single united independent India ... once his mind was made up he never reverted to any earlier position ... The ambassador of Hindu-Muslim unity had totally transformed himself into Pakistan's great leader. All that remained was for his party first, then his inchoate nation, and then his British allies to agree to the formula he had resolved upon. ^ Jalal, Ayesha (1985). The Sole Spokesman: Jinnah, the Muslim League and the Demand for Pakistan. Cambridge: Cambridge University Press. p. 43. doi:10.1017/CBO9780511558856. ISBN 9780511558856. ^ Jinnah, Mohammed Ali (9 March 1940). "The Constitutional Future of India: Two Nations in India". Time & Tide. Vol. 21 no. 10. pp. 238–240. ^ Muhammad Aslam Malik (2001). The Making of the Pakistan Resolution. Oxford University Press. p. 151. ISBN 0-19-579538-5. In the open session, on 24 March, the resolution was moved ... by Fazlul Haq, and was seconded by Khaliquzzaman (UP), Zafar Ali Khan (Punjab), Aurangzeb (NWFP), and Haroon (Sindh). ^ a b "An interpretation of the Lahore Resolution". Dawn. 23 March 2013. ^ "23 March Pakistan Resolution Day | Pakistan Muslim league (N) USA Official Website". Retrieved 14 March 2019. ^ "Text of the 1940 Lahore Resolution of the All-India Muslim League by Brian McMorrow". PBase. Retrieved 14 March 2019.